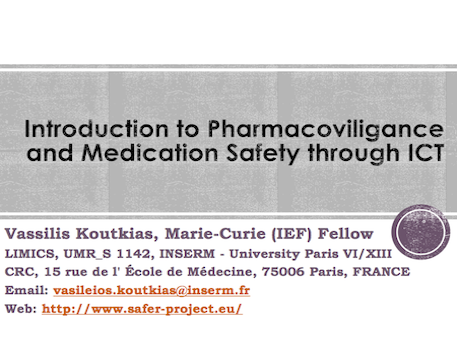 Welcome to SAFER: "Semantic integrAtion and reasoning Framework for pharmacovigilancE signals Research"! 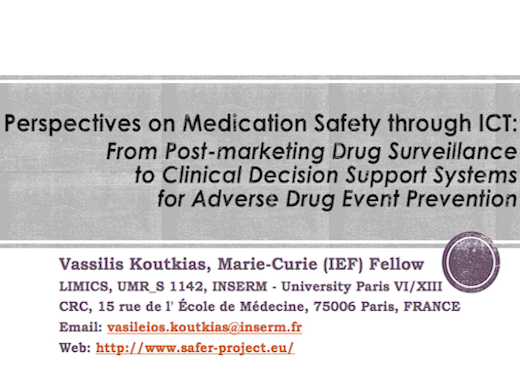 SAFER was an individual, intra-european Marie Curie fellowship project awarded to Dr. Vassilis Koutkias and supervised by Dr. Marie-Christine Jaulent. The project was conducted at LIMICS (Laboratoire d'Informatique Médicale et d'Ingénierie des Connaissances en Santé), UMR_S 1142, INSERM (Institut National de la Santé et de la Recherche Médicale), Paris, France. 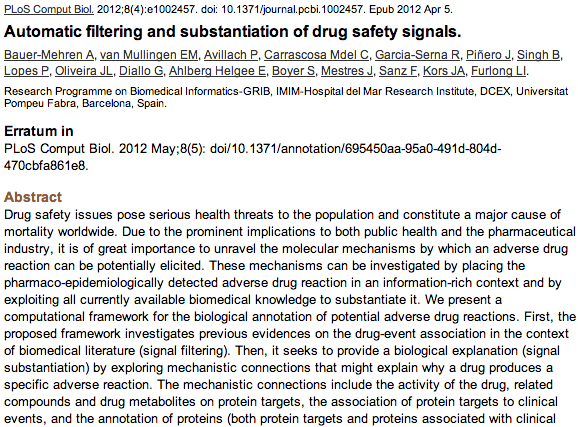 SAFER focused on pharmacovigilance with major emphasis in reinforcing signal detection through knowledge engineering. 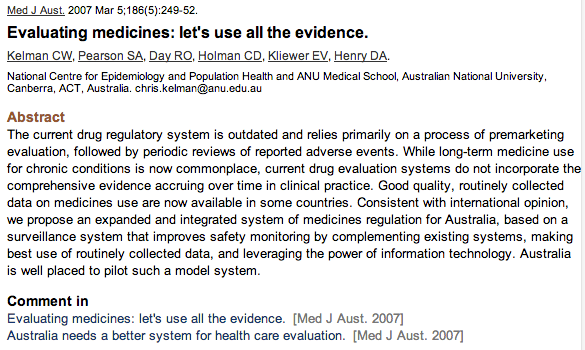 Its ultimate goal was to contribute in "revealing" drug safety risks in a timely and evidence-based fashion. In this Web site you may find information about the project, its progress and achievements. To access the provided information you may either follow the above menu options, or navigate step-by-step by pressing the Start button below. The identification of drug safety risks, such as Adverse Drug Events (ADEs) and Adverse Drug Reactions (ADRs) is a significant priority worldwide. 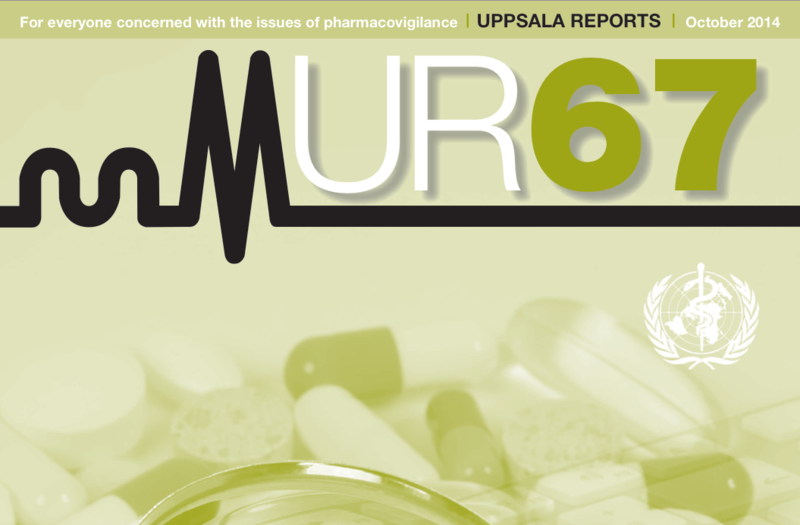 The procedures of drug surveillance and risk prevention are studied by the scientific area of pharmacovigilance. Information Technologies play a key role in achieving the goals of pharmacovigilance by introducing data and knowledge engineering methods for signal (i.e. 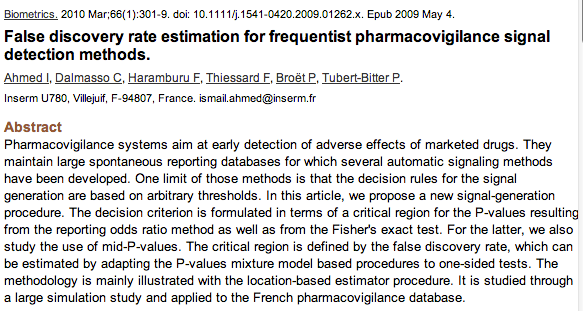 "any information - reported or computationally extracted - on a possible causal relationship between a drug and an adverse effect") detection and management. To this end, various data sources of potential signals are being explored, such as: (a) Spontaneous Reporting Systems (SRSs), through which observed cases are voluntarily reported by healthcare professionals to regulatory authorities and other bodies; (b) observational databases, e.g. Electronic Health Records, which are exploited for the identification of causal relationships between groups of problematic clinical conditions and suspected drugs, and (c) free-text resources, with scientific literature and patient self-reports being typical examples. 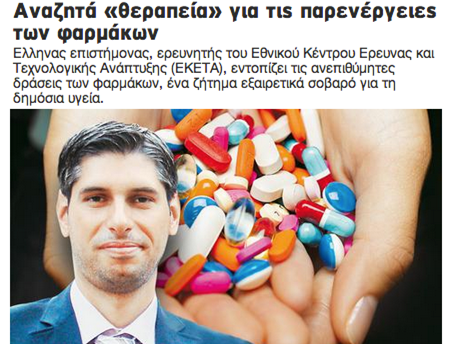 Due to the importance of drug safety and the limitations of each signal source, the need for increased drug surveillance through the synthesis of all possible information sources has been argued by international bodies, such as the European Medicines Agency (EMA), the European Commission, and highlighted in the literature. However, the heterogeneity, the fragmentation and the lack of standardised / well-defined interfaces characterizing the available data sources and the signal detection methods avert the realisation of such a synthesis. SAFER was funded by REA (Research Executive Agency) under the FP7-PEOPLE-2012-IEF call. It was an individual fellowship of the Marie Curie (PEOPLE) actions. The project reference/identifier is 330422 and it lasted from July 2013 to June 2015. The proposal of SAFER has been evaluated by the Information Science and Engineering (ENG) scientific panel. 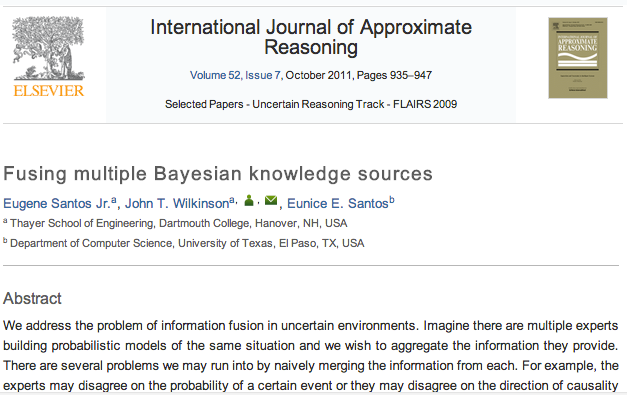 (b) the development of signal aggregation and reasoning mechanisms that will enable knowledge fusion of the obtained outcomes. In this respect, SAFER introduced overall an integrated, semantic approach for obtaining and managing knowledge on potential drug safety signals. 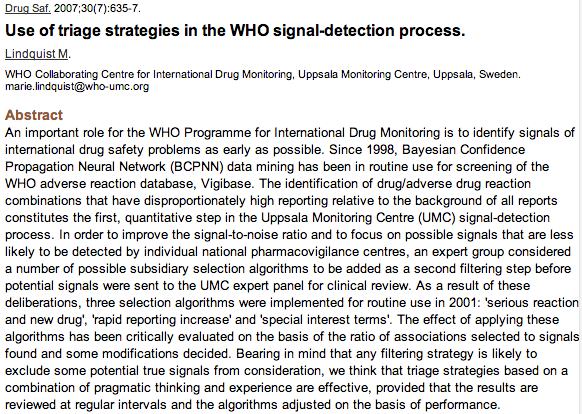 This novel approach is particularly applicable, since signal generation is characterized by incomplete knowledge and uncertainty in the results obtained from all types of signal detection methods, while each method may contribute (at a different level, with its strengths and weaknesses) in complementing our knowledge on drug safety issues. The ultimate goal of SAFER was to contribute in the interpretation of potential pharmacovigilance signals by introducing an intermediate-qualitative step between signal detection and verification, so as to leverage reliable and timely decisions on signal definition. SAFER aimed to properly detect true associations and minimize false positive findings, which are the major limitations of current computational signal detection methods. Each Workpackage included specific objectives, tasks and deliverables. The workplan comprised of both R&D (WP1-WP3) and horizontal activities (WP4: management, quality control, risk assessment, dissemination and exploitation). Milestones, major risks and mitigation actions, as well as management of intellectual property rights have been also defined. Vassilis G. Koutkias received the diploma in electrical and computer engineering in 1998 and the M.Sc. and Ph.D. degrees in medical informatics in 2001 and 2005, respectively, all from the Aristotle University of Thessaloniki (A.U.Th. ), Thessaloniki, Greece. Overall, his research interests include information management, knowledge engineering and decision support systems, as well as pervasive computing with major application areas pharmacovigilance, patient safety and personalized healthcare. 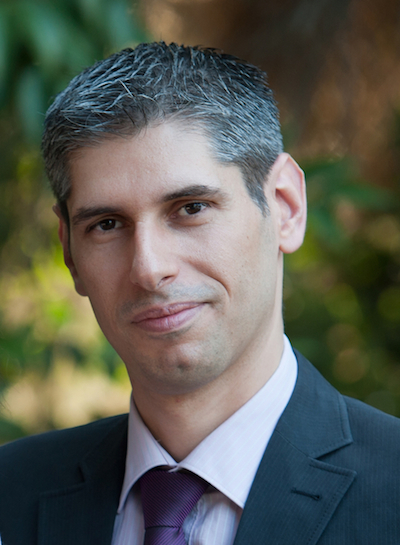 Before joining INSERM to conduct the research of SAFER, he worked with the Lab of Medical Informatics, A.U.Th., and the Institute of Applied Biosciences, at the Center for Research and Technology Hellas (CERTH), as a collaborative researcher. Since 2000, he has engaged in more than 15 EU-funded R&D projects in the fields of patient safety, personal health systems, AAL and eInclusion. He has published more than 130 papers in peer-reviewed journals, book series and conferences, edited two volumes of international book series, and co-authored a book on pervasive computing. 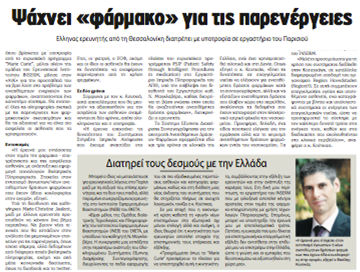 Dr. Koutkias has been appointed as a Visiting Lecturer in Université Pierre et Marie Curie, Aristotle University of Thessaloniki, the Hellenic Open University and the University of Western Macedonia. 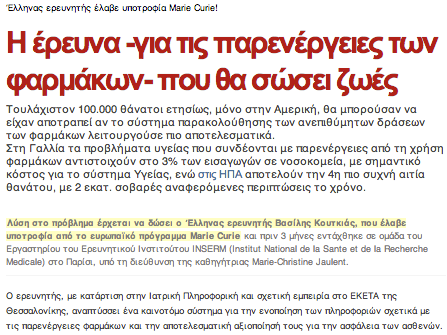 Dr. Koutkias is currently a Researcher (Grade C') with the Institute of Applied Biosciences, at CERTH. He is also an Associate Editor with the BMC Medical Informatics and Decision Making journal and Co-Editor in the Decision Support section of the IMIA Yearbook of Medical Informatics. Marie-Christine Jaulent is a Research Director at the French national medical research institute (INSERM). She has got a computer scientist degree in 1983 and a PhD degree in computer sciences, option Artificial Intelligence, in 1986. She has been an associate researcher at Boston University ("Biomedical Engineering Department") in the research laboratory "Intelligent Systems Laboratory" from 1987 to 1989. Since 1990, she is a full time researcher at INSERM in Paris, France. She leads a public INSERM research group in knowledge engineering in healthcare that develops innovative computerized methods to manage data and complex knowledge in healthcare for improving care quality and patient safety (LIMICS Inserm U1142). Author of more than 100 original scientific publications in peer-reviewed scientific journals, her current research activities are in the fields of: 1) terminologies and ontologies in healthcare, 2) semantic Electronic Healthcare Records, 3) clinical data warehouses and information quality, and 4) decision support systems for e-health. She has been involved in several national and EU R&D projects on pharmacovigilance since 2004, e.g. : EI-xplore (2004-2007); Vigitermes (2008-2010); PROTECT (2010-2015); SALUS (2012-2015). Beside this, she has been involved in Standards Developing Organizations like IHTSDO and for the period 2012-2016, she was the co-editor of the IMIA Yearbook of Medical Informatics. Up to now, Marie-Christine Jaulent has supervised 7 Post-docs and 14 PhD candidates. With respect to educational activities, she is responsible for the entire "e-health" module of the European MSc ERASMUS programme on Data Mining and Knowledge Management (DMKM) of the UPMC university in Paris that is co-directed by Lyon II Lumière University (D.A. Zighed) and Paris VI University (J.G. Ganascia). 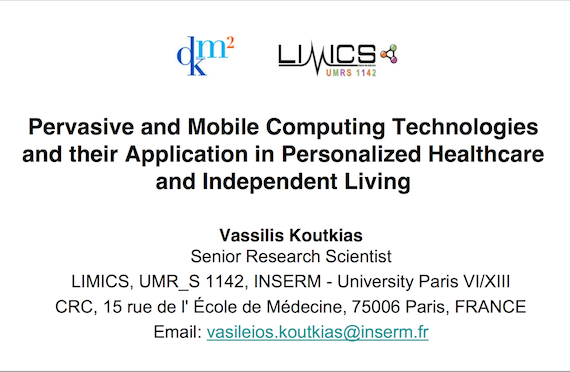 The INSERM U1142 - team is a public INSERM research team (also affiliated to the universities Pierre et Marie Curie (UPMC) and Paris 13) with a major focus on knowledge engineering in e-health. It proposes innovative computerized methods to manage data and complex knowledge in healthcare for improving care quality and patient safety. The laboratory is active in the fields of: 1) terminologies and ontologies in healthcare, 2) semantic EHRs, i.e. 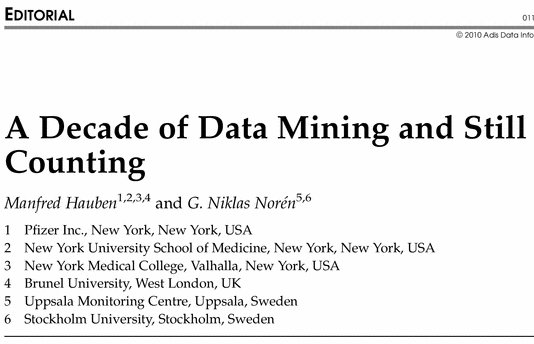 binding of standard terminologies with data structures, 3) semantic mediation and integration, 4) clinical data warehouses and information quality, 5) decision support systems for prescription assistance, and 6) text mining in large medical corpora. The application domains of its research are primarily pharmacovigilance (prevention of adverse drug effects), infectious diseases (resistance to antibiotics), rare diseases and cancer. The team includes as well the Medical Informatics Department of CHU de Saint Etienne and of Université Jean Monnet under the leadership of Prof. Jean Marie Rodrigues, member of the WHO-FIC (World Health Organization - Family of International Classifications) collaborative centre for international classifications in French language. DebugIT (FP7-ICT-2007-1.5.2, 2008-2012) - Detecting and Eliminating Bacteria UsinG Information Technology: The role of the INSERM team was threefold: 1) providing a normalized clinical data warehouse that can be queried through SPARQL endpoints, 2) contributing to the conception and development of the semantic interoperability platform of the project, and 3) developing new decision making approaches based on rule-based, fuzzy cognitive maps. 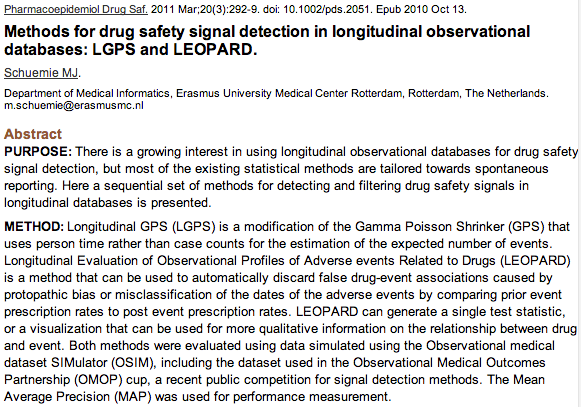 PROTECT (IMI_Call_2008_1_06, 2009-2014) - Pharmacoepidemiological Research on Outcomes of Therapeutics by a European ConsorTium: The role of the INSERM team is to introduce and evaluate semantic-based methods for grouping MedDRA ADR terms to improve the performances of signal detection algorithms. The possibility to perform semantic reasoning on MedDRA terms meaning has been shown to increase the performances of signal detection algorithms. Prior to this project, the team developed: 1) a first version of OntoADR, an ontologized version of MedDRA aligned to SNOMED CT supporting semantic reasoning on MedDRA terms, 2) PharmaMiner a tool for signal detection in pharmacovigilance, and 3) PharmARTS a Web Service for providing improved access to pharmacovigilance data. EHR4CR (IMI_Call_2009_2_09, 2011-2014) - Electronic Health Records for Clinical Research: EHR4CR is -to date- one of the largest public-private partnerships aiming at providing adaptable, reusable and scalable solutions (tools and services) for reusing data from EHR systems for clinical research. In this project the INSERM team is the leader of the Work Package devoted to semantic interoperability of the EHR4CR platform. SALUS (FP7-ICT-2011-7, 2012-2015) - Scalable, Standard based Interoperability Framework for Sustainable Proactive Post Market Safety Studies: SALUS is a Specific Targeted Research Project (STREP) coping with the development of a semantically interoperable platform through which drug safety data from multiple sources will be pro-actively monitored, linked and analysed. The role of the Inserm team is to develop a tool to facilitate the reporting of ADRs during an EHR session to regulatory bodies through standard-based Individual Case Safety Reports (ICSR). SemanticHealthNet (FP7 – NoE, 2011-2015) - Semantic Interoperability for Health Network: This network of excellence is a tranversal european project that builds resources and solutions (terminologies, ontologies, mappings, content models, archetypes, etc.) to be shared and reused among eHealth projects. The current synthesis of the group consists of 29 professors and full-time researchers, 10 post-doc and engineers and 13 PhD candidates. It constitutes a multi-disciplinary team of Computer Scientists, Medical Doctors and Pharmacists. The team has a close collaboration with AP-HP (Assistance Publique – Hôpitaux de Paris), which is the most important French University Hospital Organization with 38 hospitals and in particular in the context of the clinical information system (CIS) project led with Agfa company (Orbis Solution) which is under development. Since 2007, the team has published around 450 papers in peer-reviewed international journals, books and conference proceedings. 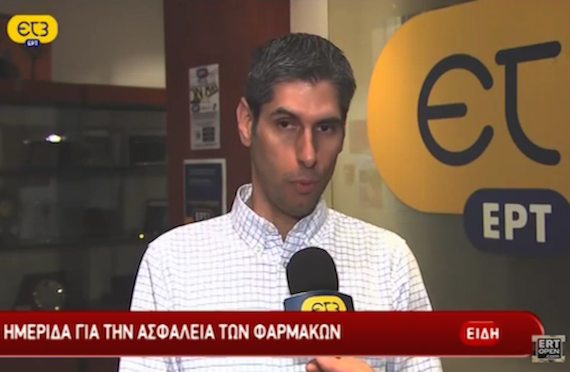 April 21, 2015: SAFER research in News Broadcast at ERT3Online, Thessaloniki, Greece. 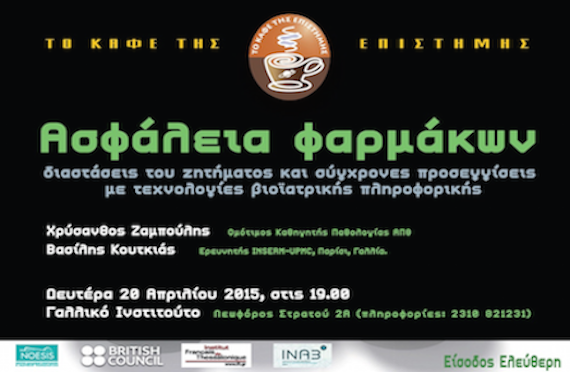 April 20, 2015: Presentation of SAFER research at French Institute, Thessaloniki, Greece. (reference in Uppsala Reports 67, p. 22). V.G. 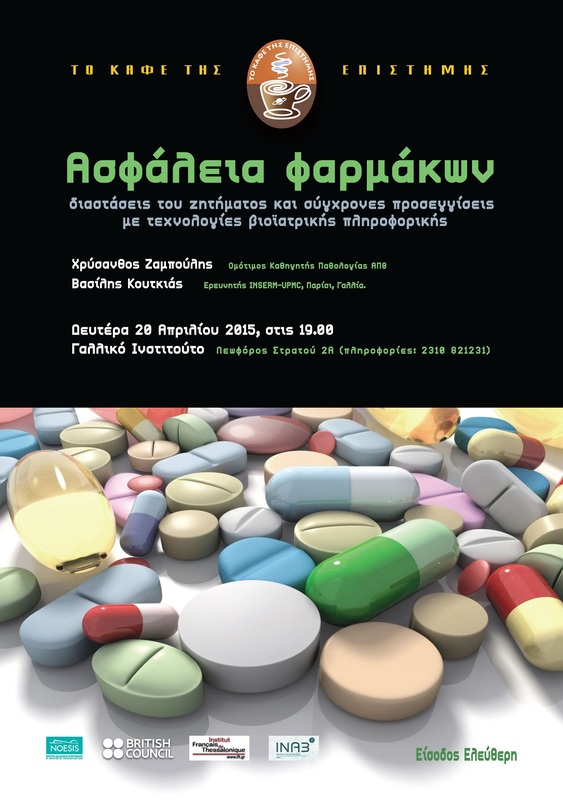 Koutkias, A. Lillo-Le Louët and M.-C. Jaulent, "Exploiting Heterogeneous Publicly Available Data Sources for Drug Safety Surveillance: Computational Framework and Case Studies", Expert Opinion on Drug Safety, vol. 17, no. 2, 2016, pp. 113-124, http://dx.doi.org/10.1080/14740338.2017.1257604. V.G. Koutkias and M.-C. Jaulent, "A Multiagent System for Integrated Detection of Pharmacovigilance Signals", Journal of Medical Systems, Special Issue on Agent-Empowered HealthCare Systems, vol. 40, no. 2, Article: 37, 2016, http://dx.doi.org/10.1007/s10916-015-0378-0. V.G. Koutkias and M.-C. Jaulent, "Computational Approaches for Pharmacovigilance Signal Detection: Toward Integrated and Semantically-enriched Frameworks", Drug Safety, vol. 38, no. 3, 2015, pp. 219-232, http://dx.doi.org/10.1007/s40264-015-0278-8. 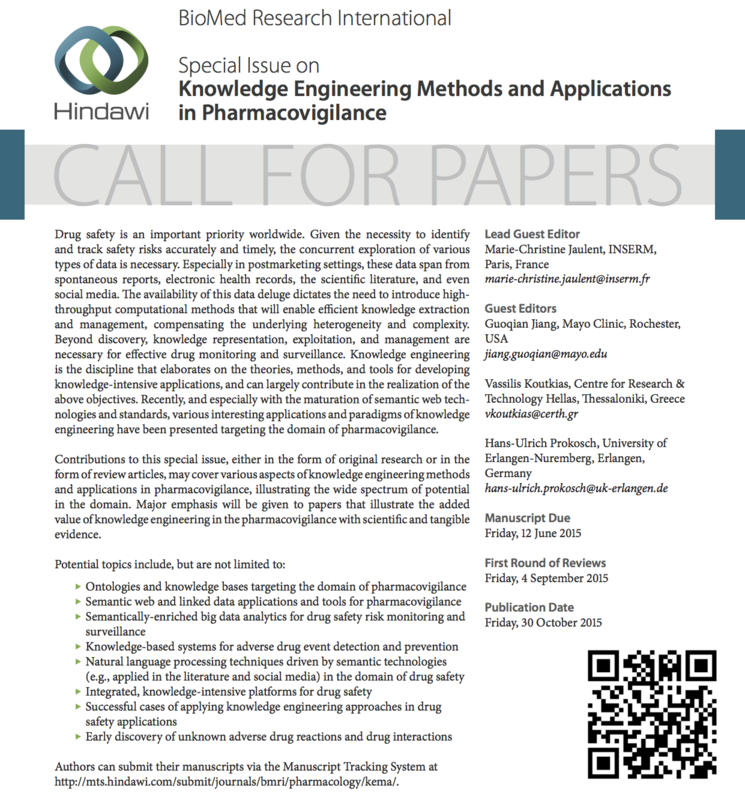 V. Koutkias, A. Lillo-Le Louët and M.-C. Jaulent, "Exploiting Heterogeneous Open Data for Pharmacovigilance", Drug Safety, vol. 38, no. 10, 2015, pp. 950-951, http://dx.doi.org/10.1007/s40264-015-0346-0. V. Koutkias, J. Souvignet, C. Bousquet, H.-U. 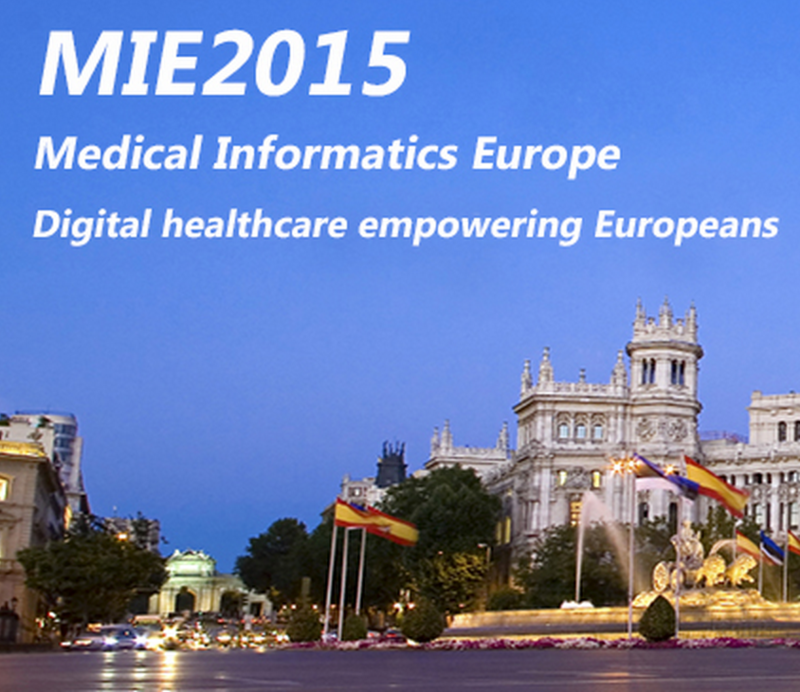 Prokosch and M.-C. Jaulent, "Leveraging Pharmacovigilance through Knowledge Engineering", 26th European Medical Informatics Conference - MIE2015, Madrid, Spain, May 27–29, 2015. V. Koutkias and M.-C. Jaulent, "Leveraging Post-marketing Drug Safety Research through Semantic Technologies: The PharmacoVigilance Signal Detectors Ontology", in Proc. of the Int. Workshop on Semantic Web Applications and Tools for Life Sciences (SWAT4LS), CEUR, Vol. 1320, Berlin, Germany, December 9-11, 2014, Available at: http://ceur-ws.org/Vol-1320/. V. Koutkias and M.-C. Jaulent, "An Agent-based Reasoning Scheme for Prioritizing Evidence Obtained from Multiple Pharmacovigilance Signal Detection Methods", AMIA Annual Symposium, Washington DC, USA, November 12-15, 2014. V. Koutkias and M.-C. Jaulent, "An Agent-based Approach for Integrated Pharmacovigilance Signal Detection", Workshop on Multi-Agent Systems for Healthcare (MASH 2014), 13th Int. Conf. on Autonomous Agents & Multiagent Systems (AAMAS), Paris, France, May 6, 2014. V. Koutkias and M.-C. Jaulent, "Towards an Integrated Framework of Pharmacovigilance Signal Detectors through Semantic Mediation", AMIA Joint Summits on Translational Science, San Francisco, USA, April 7-11, 2014. 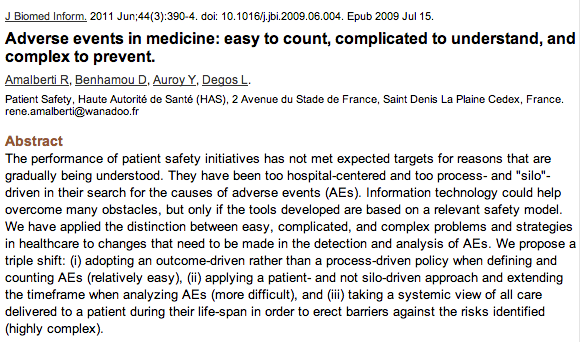 J. Bouaud and V. Koutkias, "Computerized Clinical Decision Support: Contributions from 2014", Yearb Med Inform. 2015;10(1):119-124, http://dx.doi.org/10.15265/IY-2015-036. V. Koutkias and F. Thiessard, "Big Data - Smart Health Strategies. Findings from the Yearbook 2014 Special Theme", Yearb Med Inform. 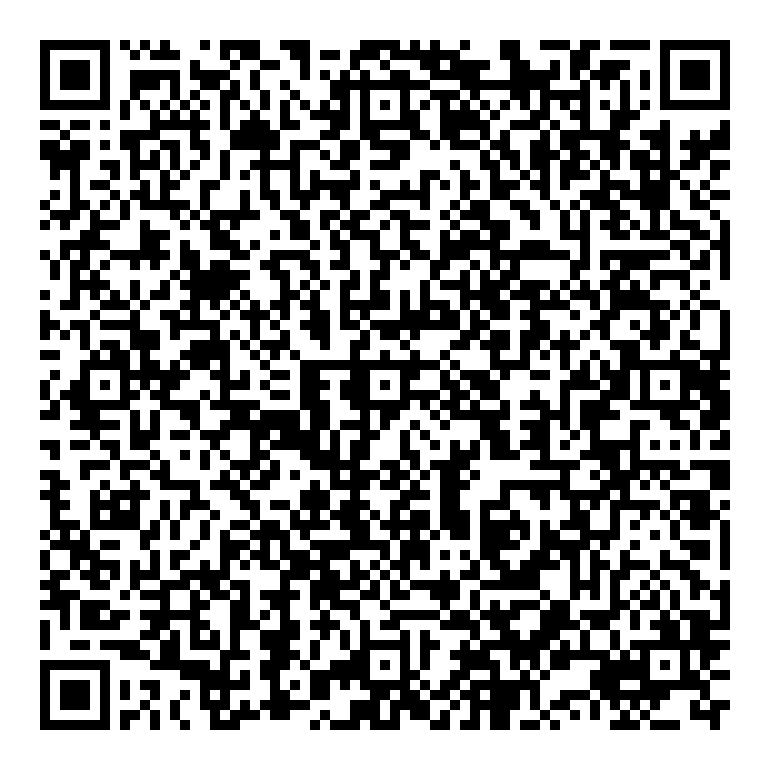 2014;9:48-51, http://dx.doi.org/10.15265/IY-2014-0031. Publication and presentation of PV-SDO in the Semantic Web Applications and Tools for Life Sciences (SWAT4LS) 2014 Workshop. The research leading to these results has received funding from the European Community’s Seventh Framework Program (FP7/2007-2013) under Grant Agreement n° 330422 – the SAFER project. © SAFER. All rights reserved.